A plotting of the cropland size categories with the number of holdings for the district of Hingoli in Maharashtra. 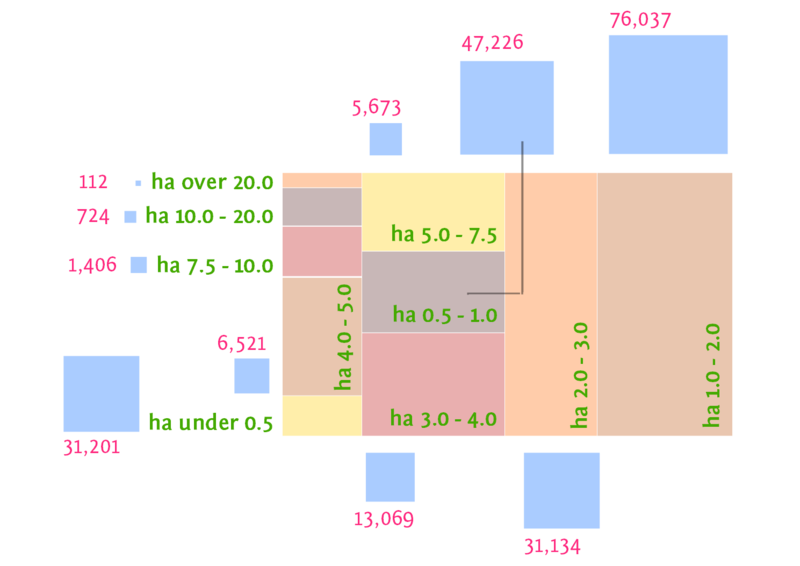 The central group of rectangles displays the distribution, relative to each other, of the size categories of holdings (in hectares, ha.). The blue squares, also relative to each other, displays the number of holdings for each farm size category. The data source is the Agricultural Census 2010-11. In the district of Hingoli, Maharashtra, the allocation of cultivated land between food crops and non-food crops is somewhat in favour of non-food crops. That is, for every hectare planted with a food crop 1.3 hectares is planted with a non-food crop. The broad categories we have under food crops are: cereals, pulses, vegetables and fruit. Under non-food crops there are: oilseeds, sugarcane, fibres, spices and fodder. Where Hingoli district is in Maharashtra state. The Agricultural Census 2010-11 detailed data for Hingoli shows that at the time of the survey 493,927 hectares were under cultivation for all kinds of crops, both food and non-food. As this is a count of how much land was under cultivation by crop, the total land under cultivation for all crops taken together is more than the total land under cultivation when measured according to land use. This is so because of crop rotation during the same agricultural year, inter-cropping and mixed cropping – for a plot, the same land may raise two kinds of crops in a year. Size categories of farm holdings, with number of holdings and total area under each category for Hingoli district, Maharashtra. The 493,927 hectares under cultivation in Hingoli are divided under 213,286 hectares for food crops and 280,640 hectares under non-food crops. This gives us the overall picture that the farming households of Hingoli choose to give more land for crop types under the ‘non-food’ category. As the settlement pattern of Hingoli is very largely rural – that means, few towns and these are the district headquarters and two more taluka centres – do the farming households of Hingoli grow enough to feed themselves comfortably? Do the farming households have the labour needed to continue cultivating so that they can feed themselves and their village communities? 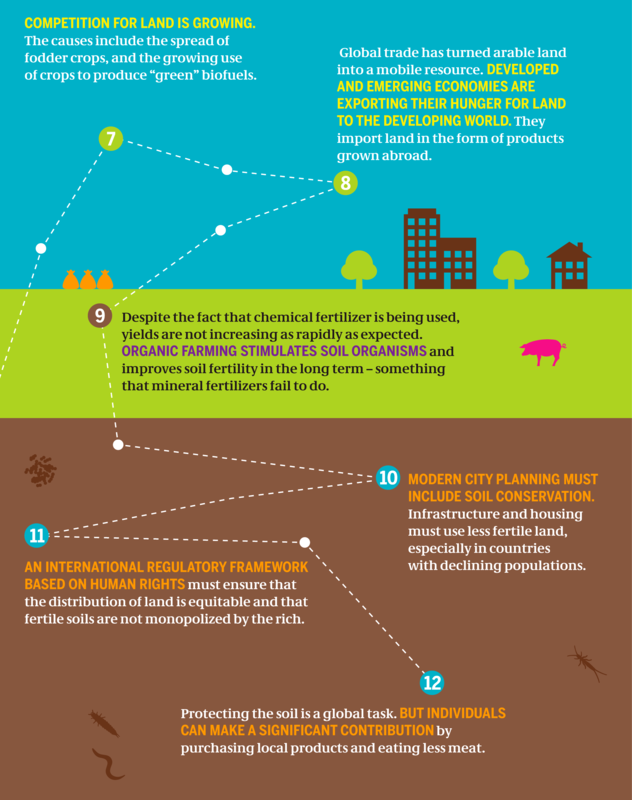 How are choices relating to land use and crop made? Using the publicly available information from a variety of government sources, we are able to find parts of answers. The Agricultural Census 2010-11 is one such source, the Census of India 2011 is another, so are the tables provided by the Department of Economics and Statistics of the Ministry of Agriculture. The graphical representation I have prepared here helps provide the land use basis upon which to layer the district information from other sources. Eight months ago, they wrote to Manmohan Singh about GM and said decisions must be “based on sound science, principles of sustainability and intergenerational justice… we sincerely hope that vested interests would not be allowed to prevail”. The ability of the biotechnology industry to pursue its aims, regardless of the orientation of the central government, became clear on 18 July 2014 when the Genetic Engineering Approval Committee (GEAC) stated to the press that it has permitted field trials of genetically modified (GM) rice, mustard, cotton, chickpea and brinjal. 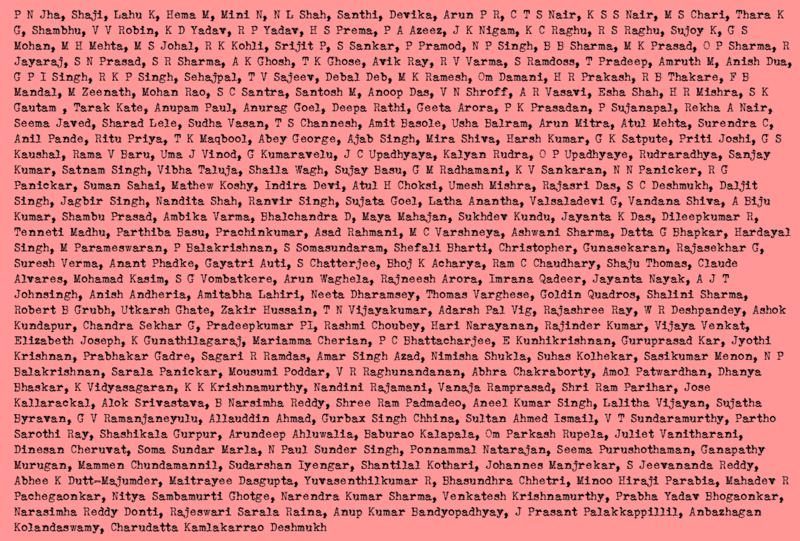 The brazen permission, with no details provided to the public of how the committee arrived at the decision (no agenda, minutes, attendance, notes, circulars), has been given by this committee despite the Supreme Court technical expert committee last year recommending an indefinite moratorium on the field trials of GM crops until government prepares a regulatory and safety mechanism, and despite the Parliamentary Standing Committee on Agriculture, in its 2012 August report, advocating powerfully for a ban on GM food crops in India. 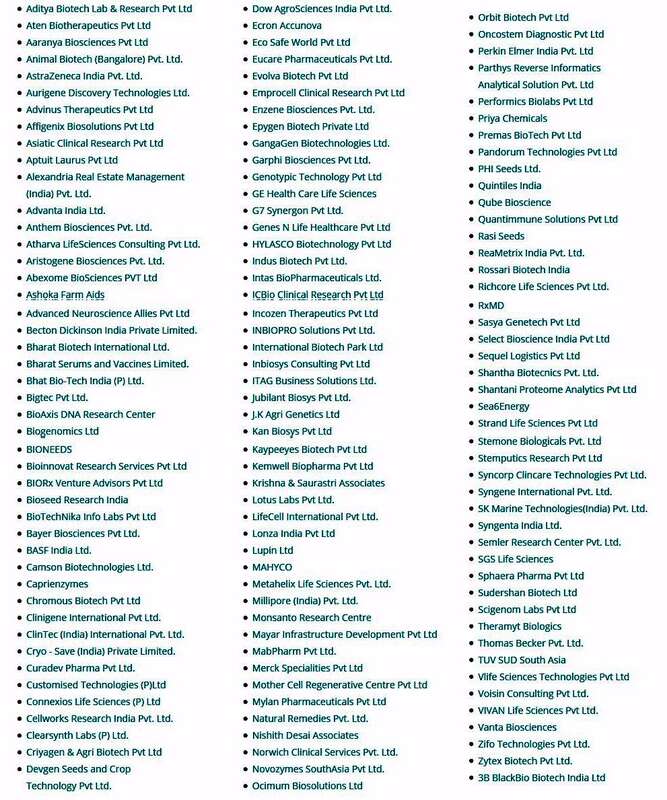 The decision to permit field trials is blatant bullying by a section of the so-called scientific and technical expertise of the Government of India, which has acted as the agent of the biotechnology industry in India and its multi-national sponsors. The permission also underlines how firmly entrenched the interests are of India’s biotech industry (which combines crops seed, pharmaceuticals and plant protection formulae) in that the industry has been able to get its way even though the manifesto of the Bharatiya Janata Party explicitly included a statement on GM. A committee such as the GEAC is unconcerned with the socio-economic ramifications of such decisions (a trait it shares with the rest of the industry-sponsored ‘scientific’ and ‘technical’ rubber stamps that litter central government, their cozy seats filled with feckless Indians). But the reaction has been swift and damning, and none of it angrier than from within the ideological allies of the BJP. The Swadeshi Jagran Manch has accused the BJP of “deceiving the people” for “neither the government nor the GEAC has disclosed as yet the contents of the promised scientific evaluation, if any, or what changed between April 7, 2014 (the day the BJP released its election manifesto) and July 18, 2014, when the field trials of GM food crops were approved”. “The people of India who have elected the BJP to power are feeling deceived,” said the statement. “They voted the BJP to power on the promises the party made to the people of India in its 2014 manifesto and speeches made by the leaders during the election.” In its election manifesto the BJP had written: “GM foods will not be allowed without full scientific evaluation on the long-term effects on soil, production and biological impact on consumers.” Those long-term effects have not been studied, and both the Department of Biotechnology and the Ministry of Environment, Forests and Climate Change have – through their inaction – failed in their duties to the government by reminding it of its objectives concerning the safety of India’s people and environment. GM seed, crops and food is not what the Nagoya Protocol means by “promoting the use of genetic resources” and this government’s statements about “fair and equitable”, about “sustainable development and human well-being” will prove to be as hollow and as cynical as the statements made, in such reckless profusion, by the Congress during both terms of the UPA. For an NDA government that has taken pride in recalling Deen Dayal Upadhya and Shyama Prasad Mookherjee, it is not too much to recall that in a letter dated 8 November 2013 (addressed to the then prime minister Manmohan Singh) 251 scientists and academicians had asked the former government to accept the final report submitted by the Supreme Court-appointed Technical Expert Committee on modern-biotechnology regulation [archive containing the Supreme Court report here, 3.2MB]. It became quickly clear that the Congress government couldn’t have cared less about the carefully considered concerns of a large group of scientists and academicians speaking in one voice. In early February 2014 Manmohan Singh, in his inaugural address at the Indian Science Congress said that India “should not succumb to unscientific prejudices against Bt crop” (in what read like a script prepared for him by the public relations agencies for Monsanto, Bayer, Syngenta, BASF and the rest of those who sit in the shadows behind the GEAC). At the time, the Coalition for a GM Free India had bluntly said Singh was wrong and was willfully misleading the country on the issue of genetically modified (GM) crops. Moreover, there is a growing body of scientific evidence on the adverse impacts of GM crops on human health, environment and farm livelihoods – compiled by the Coalition in a set of more than 400 abstracts of peer-reviewed scientific papers. The 336 seats that are occupied in the Lok Sabha – what prime minister Narendra Modi said is the ‘mandir of lokniti‘ on the first day the new government began its work – were not won for deception and false promises. Modi must annul the GEAC permissions, his government must abide by the provisions of the Supreme Court Technical Expert Committee report, and it must act on the advice of the Parliamentary Standing Committee report. Lokniti expects and deserves nothing less. India continues to be fed by its marginal and small farmers. Their holdings (those below two hectares) taken together account for 84.97% of total holdings in 2010-11 compared with 83.29% in 2005-06; the combined area under these myriad farmed plots is 44.31% of the country’s total farmed area (it was 41.14% in the 2005-06 census). India’s Agriculture Census is the largest statistical survey done by the Ministry of Agriculture, which collects data on what the ministry calls “the structural profile of Indian agriculture”. Starting with the first in 1970-71 there have been eight such censuses and the ninth is under way. The chart illustrates one aspect – a vitally important one – of the first phase of the census (which collects a list of all the agricultural holdings and includes area, gender, social group of the holder, its location code). 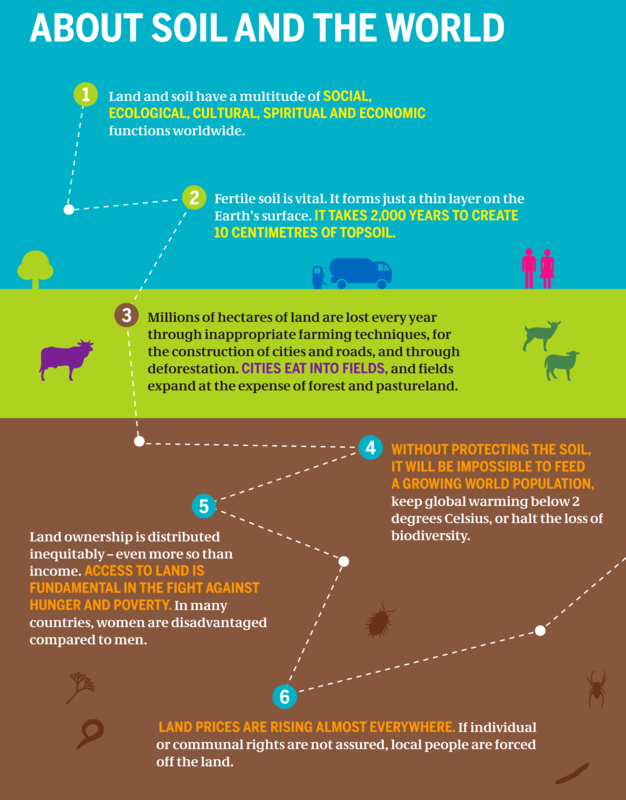 The classifications of the size of farmed land-holdings are: marginal is up to one hectare, small is one to two hectares, semi-medium is two to four hectares, medium is four to ten hectares, large is ten hectares and more. The Agriculture Census 2010-11 (Phase-I), All-India report on number and area of operational holdings(provisional) by the Agriculture Census Division, Department Of Agriculture and Co-operation, Ministry Of Agriculture, Government Of India (that’s the full, official and imposing title of the gigantic exercise) has told us, so far, that the numbers of marginal and small holdings continues to rise with every agricultural census (every five years, but the periodicity is less regular). Some of the most salient findings so far from the 2010-11 census: the total number of farmed plots in India has increased from 129 million in 2005-06 to 138 million 2010-11; there is a small increase in the farmed land area from 158.32 million hectares in 2005-06 to 159.18 million hectares in 2010-11; the average size of a farmed land-holding has declined to 1.16 hectares in 2010-11 compared with 1.23 hectares in 2005-06. 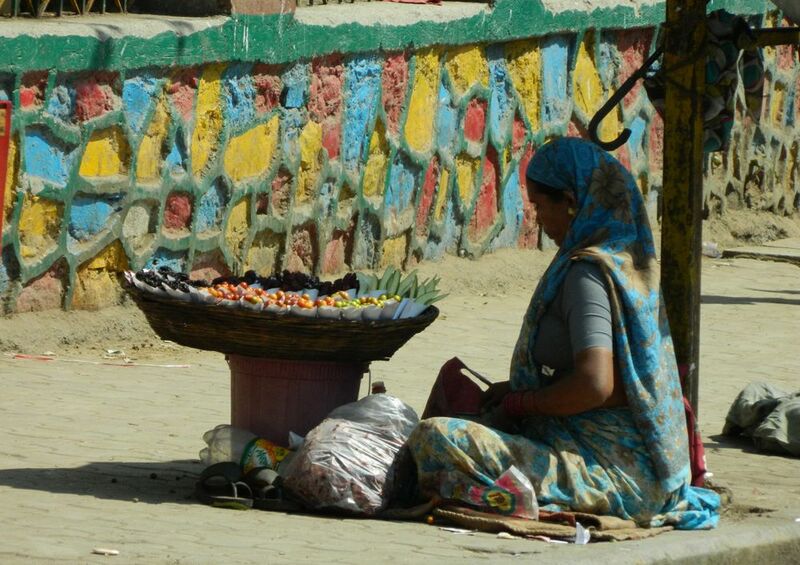 A woman sells small seasonal fruit from her basket on a bust main road in Mumbai (Bombay). In both 2009 and well as this year, 2012, there were droughts. The impact of one drought on rural cultivating households is considerable, and we have known of the severity of these impacts ever since the chronicling of the famines of 1943-44. What happens when over a five-year period, there are two droughts? Before the end of 2012, we shall begin to know, and this will be a grim learning – drawing from the conclusions of several surveys conducted on drought and its impacts between 1970 and 2002, rural cultivating households suffer annual income losses of at times more than 60% in drought years. Can they recover enough in three years to withstand such drastic income erosion a second time in quick succession? We will learn soon enough, but the circumstances in which we learn is already being influences by major changes afoot. Let us consider the global concern about drought and the need expressed for support to cultivating (and rural food consuming) populations experiencing drought (and food price inflation) stress. 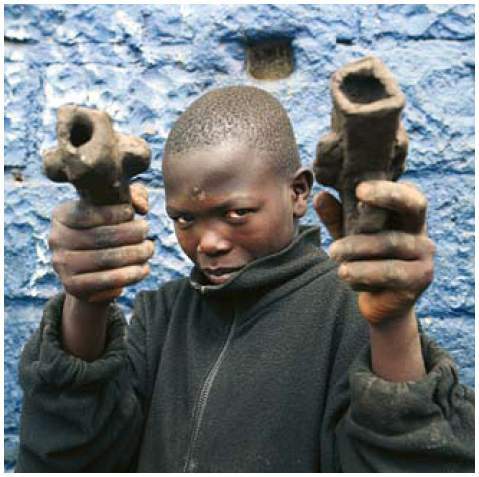 “We cannot allow these historic price hikes to turn into a lifetime of perils as families take their children out of school and eat less nutritious food to compensate for the high prices,” said World Bank Group President Jim Yong Kim in a recent statement concerning high food prices. 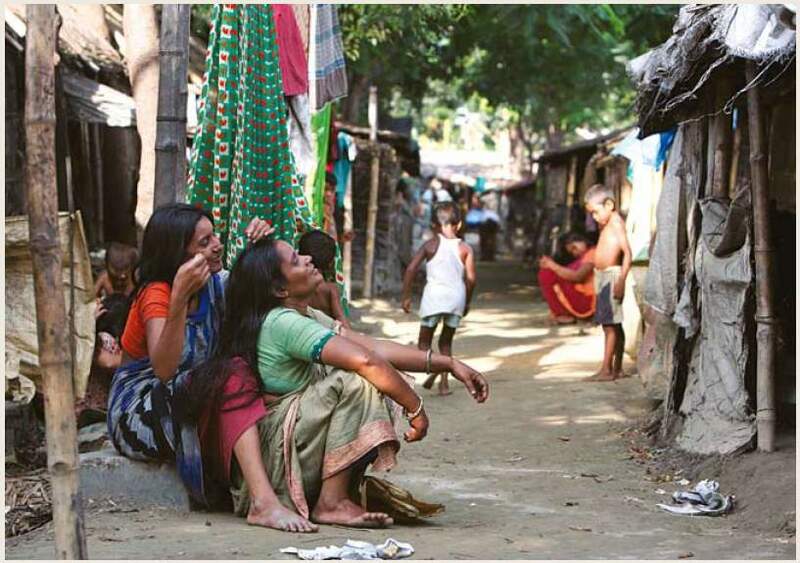 “Countries must strengthen their targeted programmes to ease the pressure on the most vulnerable population, and implement the right policies.” The World Bank, together with other multi-lateral lending organisations and many governments worried about agrarian distress and chronic food price inflation, has spoken often about “measures and policy to protect the most vulnerable against future shocks”. 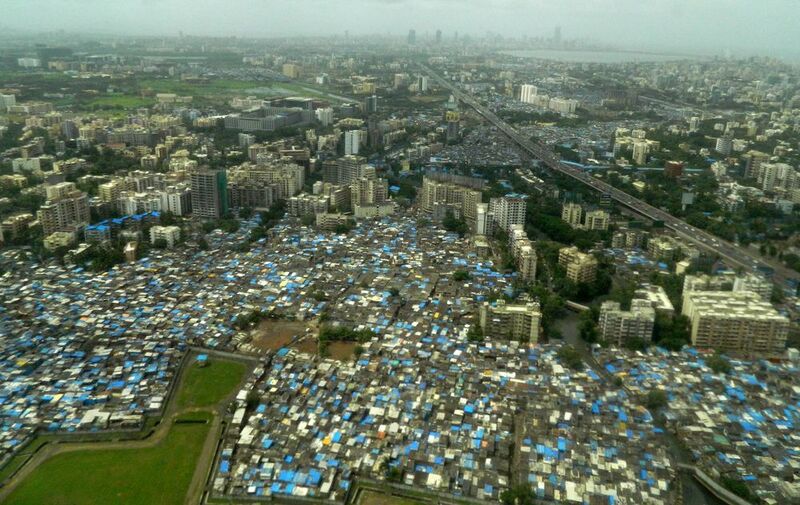 The immense sprawl of Mumbai, with over 20 million inhabitants, a food magnet that drains food producing districts up to 500 kilometres inland. What sort of measures have been and are being discussed and implemented? They include agriculture-related investment, policy advice, fast-track financing, support for safety nets, the multi-donor food security programmes, and risk management products. The Government of India has also talked about cash transfers and increased investment in agriculture, in the same breath that it has talked about technological ‘solutions’ (the introduction of drought-resistant crop varieties, they like to call it) to surmount the yield per hectare limits currently experienced in food crop staples. How sensible or opportunistic are these measures? How true are they towards being ‘inclusive’ and ‘participatory’ (terms our government and major line ministries, including the Ministry of Agriculture and the Ministry of Rural Development, like to use)? How much are they driven by the demands of industry rather than the needs of the food insecure and price vulnerable? Before I indicate some of the answers, it is useful to look at the conditions in the same sector in our neighbour, the People’s Republic of China. Inside China, the country is fast approaching the limit of its own available farmland resources – the so-called ‘red line’ for food security of 120 million hectares of arable land, set by the government. China’s typical solution has been to import cheaper agriculture commodities like soybean and maize while saving its farmland for higher-value exports like fish and vegetables. But there is another force driving the rise in soybean and maize imports: the rise in meat consumption in China (a reduced example of which we are seeing in the cities and towns of India, in which the middle class diet includes a growing meat component, usually poultry). In China, meat is increasingly coming from large-scale commercial farms – not small-scale or household farmers – and is therefore dependent on animal feed rather than food waste (which has and continues to be an important portion of animal feed – think goats and chicken – for India’s small agricultural households). 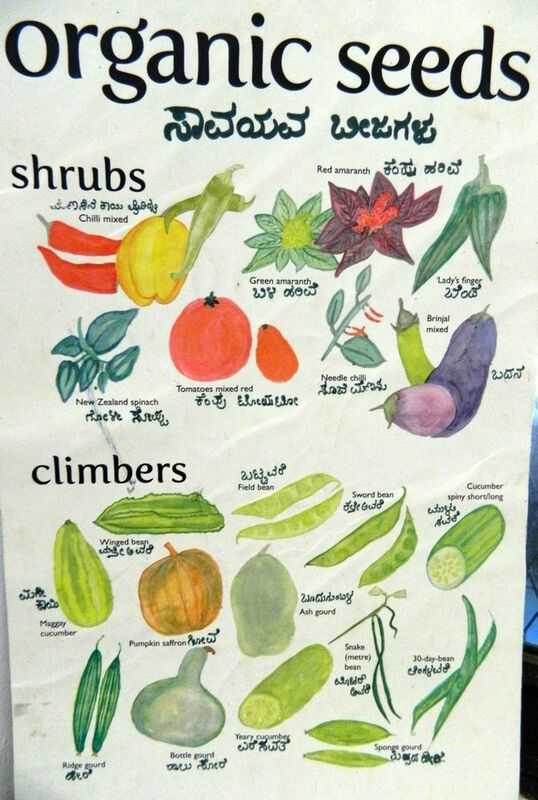 From a growers’ collective in India’s Western Ghats region, a visual aid to help urban consumers identify vegetables that can be grown organically in cities. Looking back at the pronouncements of India’s planners – whether in the Ministry of Agriculture, in the Ministry of Chemicals and Fertilisers, the directorates in states for major crops and horticulture – and its lobbyists (mostly in the chambers of commerce and trade associations) one comparison made frequently with China is seen: that our per hectare use of fertiliser is low. What they conceal is the tremendous ecological damage that has taken place in China as a result of unregulated growth in the use of synthetic and inorganic fertilisers, which has rendered toxic and sterile vast farming tracts in China. To even consider such an approach in India ought to be anathema to our farmers – but they are being pressured and coerced by a business-centric lobbying front which is alas being supported by the central government and by the governments of major states. “Smallholder farmers are capable of producing the food necessary to feed their country, but face increasingly difficult barriers,” concluded a recent report from the international NGO Grain, which campaigns for farmers’ rights worldwide. The report by Grain added that government decisions to rely on agricultural commodity imports serve the interests of agribusiness and its need for cheap sources of feed “but threaten the land, livelihoods and local food systems of communities”. It is this linkage that lurks behind the recent ‘reform’ (a distorted and dangerous term) that now has permitted foreign direct investment (FDI) in India’s (and Bharat’s) agriculture and food retail sector. Such changes come against a legacy of corruption concerning access to and misuse of foodgrains that deeply affect our public distribution system and with it, equitable and affordable access for our population to nutritious food. A recent report in Bloomberg, the international news agency, exposed one such fraud, which found that Rs 2,700 crore worth of foodgrain “was looted by corrupt politicians and their criminal syndicates over the past decade” in Uttar Pradesh alone. The report quoted Naresh Saxena, a commissioner to the Supreme Court who monitors hunger-based programmes across India, as having said: “This is the most mean-spirited, ruthlessly executed corruption because it hits the poorest and most vulnerable in society. What I find even more shocking is the lack of willingness in trying to stop it.” How can they begin to stop it when, in a country whose agricultural production in absolute numbers has reached ecological limits, the food retail and processed food industry continues to demand more? And will pay more for new supplies and will gratify the looters more? 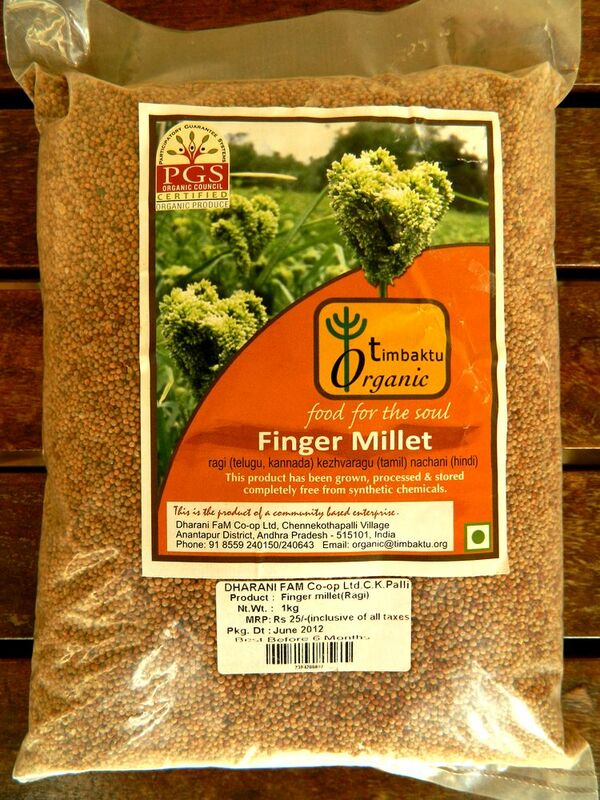 A one-kilo packet of ‘ragi’ (finger millet) from an organic farm in Andhra Pradesh state, central India, packaged and labelled in a manner that provides an alternative to the premium rice brands (mostly basmati) sold in urban centres. Imagine the psychological effect of this sort of fraud on those who work in and for our agriculture markets. The number of regulated (secondary) agricultural markets (‘mandis’) stood at 7,157 as of March 2010 (compared to just 286 in 1950). 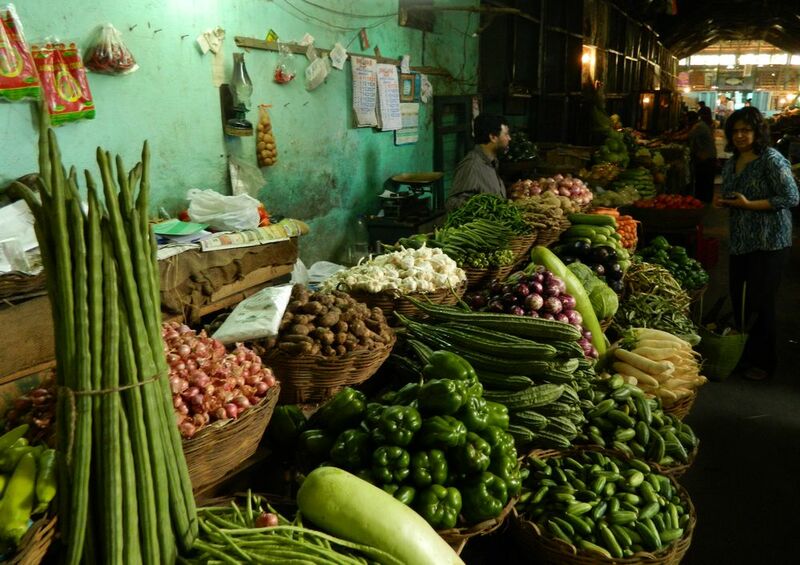 There are also reckoned to be about 22,200 rural periodical markets, about 15% of which function under the ambit of APMC (Agricultural Produce Market Committees) regulations (there are at least 27 such acts in different states). It is against this density of local collection and distribution that the impact of agri-business on inflation (both direct and indirect) may be viewed. The direct impact of agribusiness is visible in the form of food price inflation, as the Reserve Bank of India has also observed. There is demand arising from increasing population and (especially in urban and urbanising centres – see this report in a business daily, which ignores entirely the food demand footprint of urbanising India) prosperity has outstripped the growth of agricultural output, hence food inflation in India will certainly to persist and deepen (in rural areas as a result of the agri-business-led escalation of marketing channels and investment in infrastructure to move crop and food – the current government and its industry partners are doing all they can to convince middle-class urban India this is good for ‘growth’). There is a dictatorial emphasis on food processing, on trading (consider the number of commodity exchanges today compared with ten years ago, and the much enlarged scope of their futures trading business, all of which requires access to stored raw crop that serves as the basis of such trade) and on marketing. The growing demand for protein-rich and what are called “high-value foods” (fruit, vegetables, edible oil and meat) is simultaneously raising the demand for what the food industry (processed food manufacturers, food retailers, crop terminal markets promoters, exporters) calls “high quality, safe and convenient (frozen, pre-cut, pre-cooked and ready-to-eat) foods”. Hence the view now shared by the central government, planning agencies and business and industry associations is that meeting these demands will facilitate growth (of national GDP and of the agriculture sector; see the National Summary Data Page for growth rates, however meaningless these are to the cultivating households of rural Bharat) and moderate inflation (in complete disregard of evidence from countries all over the world in which the growth of modern food retail has contributed to inflation in the prices of food staples). The strength of the ‘growth’ totem does not diminish, and nor does the artificially inflated appeal of the ‘growth is good, more growth is better’ fiction. This is wholly and utterly misguided and mischievous and is responsible for deepening the agrarian distress in Bharat. How entrenched this fiction is can be seen in allegedly authoritative pronouncements that can be found even by the RBI, which recently said: “There is, however, near unanimity, amongst all that agriculture and agri-business growth is a necessary prerequisite for moderation of inflation, particularly food inflation, as well as for acceleration and sustenance of inclusive growth.” Growth as defined by the resource-intensive and ecologically destructive direction of the central government, Indian business and an urban middle class divorced from rural realities has directly caused this same inflation the RBI (and others) is complaining about. Yet in the policy space the contradiction is ignored – true reform that benefits Bharat rather than India is not considered. 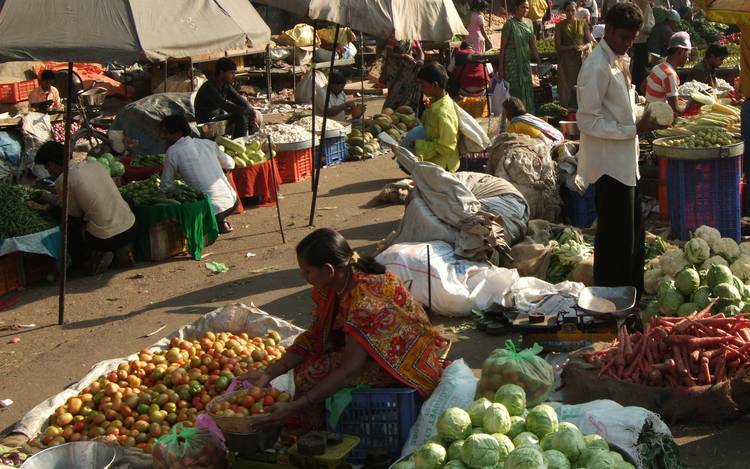 A neighbourhood vegetable market in Bengaluru (Bangalore). How these small markets cope with the dictatorship of the food retail and food processing industry will depend on local consumers and their support. Our central problem in the near future will continue to be the divide between Bharat and India, between food growers and the food consuming populations they support (usually unseen and unheard, often unrepresented). The English-language media that represents the interests of the well-off urban elite have become uniformly uncritical of the different aspects of agri-business and the ‘supply chain’ (another loaded term that spells danger for rural Bharat) which are being transformed (to be fair, major regional language media can be equally uncritical). Reports such as these, one from an Indian business and finance daily, Mint (which holds up GM food as the panacea for India’s food insecurity, and the other from the Wall Street Journal, which is read and quoted in business circles (which said the new ‘reforms’ are not comprehensive enough), reflect the aspirations and tendencies of urban upper middle class India and the disproportionate influence this minority enjoys over national policy, especially policy concerning agriculture and food. These media views celebrate “rural prosperity” which is “thanks to government job schemes” (no mention of the labour distorting effect of MGNREGA (the Mahatma Gandhi National Rural Employment Guarantee Act) that is now widespread and which has pushed up farm labour costs to benefit the manufacturers of agricultural machinery – see this report for one of the implications of this cost rise, and see this compilation [pdf] by the Indian Social Institute on NREGA-related wages news), the drive for more “domestic demand from rural areas” (to benefit the consumer goods companies and their financiers primarily), the need for “better private-sector jobs in manufacturing and services”, the obsession with how to “boost purchasing power” and the tiresome illogic of “a virtuous cycle of growth”. O mighty tractor, meet puny humans! One of the Planning Commission of India’s working groups of agriculture concerns ‘crop husbandry, agricultural inputs, demand and supply projections and agricultural statistics for the Twelfth Five Year Plan (2012-17)’ which is a lot to expect out of a single committee, howsoever eminent the members and however luminous their output. In a short chapter on energy use in Indian farms, the committee has said: “While developed world mechanised its agriculture to create surplus labour for the industrial sector, in India it has been directed to help farmers and farm worker do their job speedily”. Curious. When I last looked in the districts, there were Escorts, Mahindra, TAFE, Sonalika, Swaraj, HMT, Indofarm and Force tractors. Foreign farm equipment manufacturers like John Deere and Kubota are already here, ready to assist the “farm worker do their job speedily”? Not likely, ready instead to follow the diktat of the central government to replace human labour, send human farm labour on its way to the towns and cities to become obedient consumers. But the committee has more to say: “With high quality job, [the farm worker will] acquire additional capacity to achieve timeliness in field operations without much hardship and drudgery.” That is indeed a considerateness I hardly expected to see in this day and age of austere governments and spartan budgets. Hardship and drudgery are constant companions of the cultivator in India – the smaller the cultivator, the more bosom these buddies. The committee has however taken a nostalgic look at the years when India resounded to the “jai jawan, jai kisan” slogan. 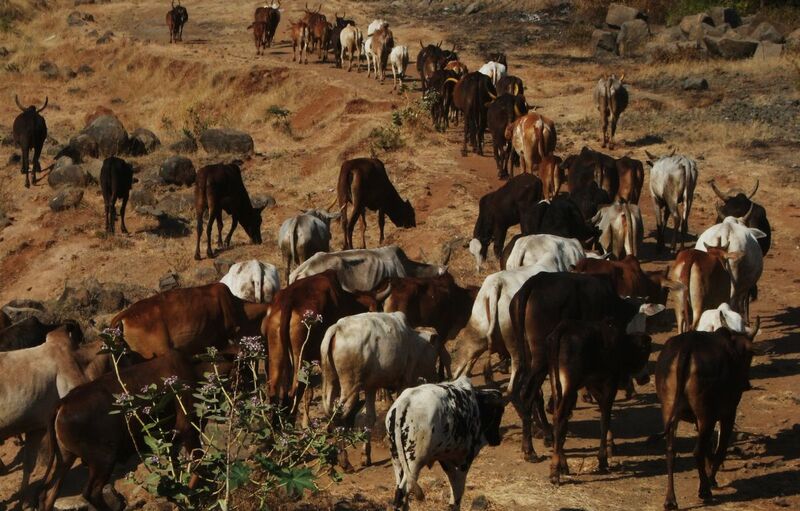 Its report has reminisced: “Bullocks and other draft animals continue to have relevance in India for socio-economic reasons particularly to marginal and small farmers”. But right away comes the transnational multinational structurally adjusted hard-boiled World Bank-IMF-Prime Minister’s Office-Planned Decommissioning of India approach. And there we have it, bold and ugly – humans are not fit to cultivate. The age of the tractor has hit rural Bharat with as much force as BMW, Mercedes Benz and Audi have hit the semi-paved streets of Malltown India. Animals are troublesome beasts, humans are worth only 0.05 kw each and tractors are glorious. John Deere, are you here? 2012 marks the 50th anniversary of the implementation of the EU’s Common Agriculture Policy (CAP), described rather pompously by the European Commission as “a cornerstone of European integration” – well, it is true that farming has done a lot more for the idea of Europa than the euro has. 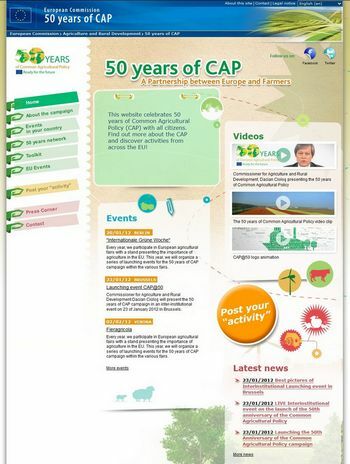 CAP “has provided European citizens with 50 years of food security and a living countryside”, the celebratory website has explained. The CAP remains the only EU policy where there is a common EU framework and the majority of public spending in all Member States comes from the EU budget, rather than from national or regional budgets, we are told. I should have expected the EU to ignore entirely the trifling matter of the steady impoverishment of European societies, especially the second and third tier Euro societies – which is particularly those countries beyond the EU-15. What has the CAP done for them, for the relative late-comers to the European idea? But, the Eurocrats have said that “figures show that the CAP has helped see a steady increase in economic value, in productivity, and in trade, while also allowing the share of household spending on food to be halved”. Oh, that’s all right then – we were just looking at the wrong figures. Silly us. “The CAP is a policy that has always evolved to address necessary challenges,” the pomposity continues. For example, we are told that the reform process since 1992 “has seen a move towards much greater market orientation and away from trade-distorting support” – um, did we notice a few years ago that the average EU cow (or ox) receives more by way of subventions than quite a few of the poorer humans in ‘developing’ Asia, Africa, South-East Asia and South America? Oh, sorry, wrong figures again. Bother such troublesome data. Being the dynamic and forward-looking CAP that it is, it has also taken “into account consumer concerns about issues such as animal welfare, and the doubling of the number of farmers within the EU (following enlargement from 15 to 27 Member States)”. There we are – that’s the first tier nod to the third tier EU lot, and said ruffians should be pleased. In October 2011, the European Commission presented its latest proposals for further reforms – haven’t we been through all this before? more reform? are you chaps quite blind to what’s happening to your favourite currency while you’ve been reforming? or is it the very latest blend from the new ultra-snob coffee bistro in Brussels that’s to blame? – to the CAP. What, pray, are these 50th anniversary, limited edition reforms all about? At “addressing the challenges of today and tomorrow: food security; climate change; the sustainable use of natural resources; balanced regional development; helping the farming sector cope with the effects of the economic crisis and with the increased volatility of agricultural prices; and contributing to smart, sustainable and inclusive growth in line with the Europe 2020 strategy”. Alea jacta est, and especially those so for farmers and their families who live somewhere between EU15 and EU27, for this is a signal to tighten their already painfully tight belts, and salt what remains of the day’s spud. • On 14 January 1962, after 140 hours of negotiations (the first European agricultural marathon), the Council of Ministers of the Six took the decision to proceed to the second stage of the transition period, to establish common agricultural market organisations for each product, to apply specific competition rules and to create a European Agricultural Guidance and Guarantee Fund (EAGGF). • 4 April 1962: Following a second agricultural marathon, the texts of the regulations were adopted by the Council. • 20 April 1962: The texts were published. The date that they came into effect depended on the start of the market season: for instance, for the common market organisation for cereals, eggs, poultry, meat and pork the date of entry into effect was 1 July 1962. • 1962: The Common Agricultural Policy (CAP) is born! The essence of the policy is to provide affordable food for EU citizens and a fair standard of living for farmers. • 1984: Milk quotas – Specific measures are put in place to align milk production with market needs. • 1992: “Mac Sharry” reform – The CAP shifts from market support to producer support. Price support is replaced with direct aid payments. There is increased emphasis on food quality, protecting traditional and regional foods and caring for the environment. • 2000: The scope of the CAP is widened to include rural development. The CAP focuses on the economic, social and cultural development of Europe with targeted multi-annual programmes, designed at national, regional or local level. • 2003: “Fischler/Mid-term Review” reform – CAP reform cuts the link between subsidies and production. Farmers are more market oriented and, in view of the specific constraints on European agriculture, they receive an income aid. They have to respect specific environmental, animal welfare and food safety standards. • 2004 & 2007: EU farming population doubles, following recent enlargements with 12 New Member States. EU’s agricultural and rural landscape changes as well. • 2012: New CAP reform negotiations to strengthen the economic and ecological competitiveness of the agricultural sector, to promote innovation, to combat climate change and to support employment and growth in rural areas. Xinhua has reported that about 2.2 million people in China are short of drinking water as severe droughts continue to plague winter wheat producing areas. Relaying information provided by China’s drought relief authorities, the Xinhua report said that rainfall in Henan, Shanxi, Hebei, Shandong, Jiangsu, Anhui and Shaanxi provinces has decreased 20% to 90% over the last four months from the same-period average. The news agency quoted Chen Lei, deputy director of the State Flood Control and Drought Relief Headquarters. Relentless droughts that started to dry out winter wheat producing areas such as Shandong and Henan provinces in November continue, affecting some 4 million hectares of cropland, said Chen. Water supply is running low in cities around the Yellow, Huaihe and Haihe rivers in northern and central parts of China, he said. Underlining the contradictory perceptions of agencies and the world grain trade, Bloomberg has reported an assessment by the China Meteorological Administration as saying that dry weather conditions in northern China have had “no apparent impact” on most of the regions’ wheat crops because there is sufficient accumulated moisture in deeper soil layers. Even so, unusual dryness in the north and snowy conditions in southern China were caused by the La Nina weather pattern, the Meteorological report is quoted as having said, with some southern provinces experiencing the coldest January since 1961. The price of a basket of staple foods has become crippling in rural and urban India. The government’s response is to favour agri-commodity markets, greater retail investment and more technology inputs. 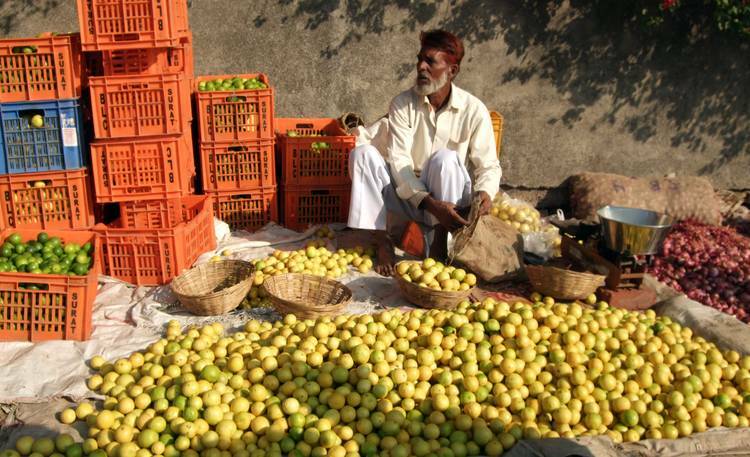 For food grower and consumer alike, the need for genuine farm swaraj has never been greater. The retail prices of staple foods rose steadily through 2010, far exceeding in real terms what the Government of India and the financial system call “headline inflation”, and exceeding also the rate of the rise in food inflation as calculated for the country. These calculations ignore the effective inflation and its increase as experienced by the rural and urban household, and they ignore also the considerable regional variations in India of a typical monthly food basket. Moreover, from a household perspective an increase in the prices of food staples is not seen as an annual phenomenon, to be compared with some point 12 months in the past. It is intimately linked to employment (whether informal or seasonal), net income, and the pressures on the food budget from competing demands of medical treatment, education and expenses on fuel and energy. When real net income remains unchanged for over a year or longer, the household suffers a contraction in the budget available for the food basket, and this contraction – often experienced by rural cultivator families and agricultural labour – is only very inadequately reflected by the national rate of increase in food inflation. An indicator of the impact on households is provided by the price monitoring cell of the Department Of Consumer Affairs, Ministry Of Consumer Affairs, Food and Public Distribution. This cell records the retail and wholesale prices of essential commodities in 37 cities and towns in India. Data over a 36-month period (2008 January to 2010 December) for the prices of cereals, pulses, sugar, tea, milk and onions reveals the impact of the steady rise in the Indian household’s food basket. In 33 cities and towns for which there are regular price entries, the price per kilo of the “fair average” quality of rice has risen by an average of 42% over the calendar period 2008 January to 2010 December. In 12 of these urban centres the increase has been over 50% (Vijayawada, Thiruvananthapuram, Hyderabad, Bengaluru, Patna, Cuttack, Bhubaneshwar, Indore, Bhopal, Shimla, Karnal and Hisar). The average price rise over the same period for a kilo of tur dal, for 32 cities for which there is regular price data, is 46%. In 11 of these urban centres the increase in the price of tur dal has been over 50% (Puducherry, Bengaluru, Patna, Agartala, Nagpur, Mumbai, Indore, Ahmedabad, Shimla, Jammu and New Delhi). Where wheat is concerned, from among the 27 cities and towns for which there are regular price entries over three years, in 10 the per kilo price rise is 30% and more. If in search of a comforting cup of tea over which to rue the effect of the steady price rise, this too will cost a great deal more than it did three years ago. For 25 urban centres with regular price data, the average increase over the same period of 100 grams of loose tea leaf is 38% and in 11 of these cities and towns the increase is between 40% and 100%. The sugar with which to sweeten that cup of tea has become prohibitively expensive over the January 2008 to December 2010 period. For the 32 cities and towns for which there is regular price data, the average price increase for a kilo of sugar is 102%, the range of increase being between 76% and 125%. This increase for sugar – relatively homogenous for the price reporting centres – exhibits the countrywide nature of the price rise of the commodity. Nor is there a household economy case for substituting sugar for gur, or jaggery. For the 17 towns and cities reporting data for gur prices over the same 36-month period, the increase in price over the period has been an average 118% with 11 of these centres recording an increase of over 100%. 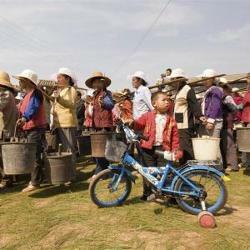 Adding a third element of higher cost to the humble cup of tea is the price of milk. For the 25 towns and cities which recorded increases in the per litre price of milk over the 36-month period (one city recorded a drop) the average rise is 37%. In seven cities a litre of milk costs at least 50% more in December 2010 than what it did in January 2008 – Ahmedabad, Bhopal, Indore, Jaipur, Jodhpur, Patna and Hyderabad. In conspicuous contrast are the rates of increase in price of cooking media – groundnut oil, mustard oil and vanaspati. Over the January 2008 to December 2010 period the 37 urban centres recorded average price increases of 10%, 9% and 10% respectively for groundnut oil, mustard oil and vanaspati. Finally, the volatile allium cepa, or common red onion. In 29 cities and towns reporting regularly the per kilo prices of onion, the increase in price of the vegetable has been astonishingly steep. The average increase for 29 cities is 197.5% and in 14 the increase has been 200% and above – New Delhi, Shimla, Ahmedabad, Indore, Mumbai, Rajkot, Agartala, Aizawl, Bhubaneshwar, Cuttack, Kolkata, Chennai, Hyderabad and Vijaywada. In pale comparison is the otherwise worrying average increase of 39.5% for a kilo of potatoes – this is the 36-month average increase recorded by 27 urban centres. My contribution to your call on FSN for a statement on food, agriculture and cities follows. I work in India, with a Ministry of Agriculture programme called National Agricultural Innovation Project. One of its sub-projects is a knowledge-sharing effort that links crop science and farm practice through ICT. Within that framework I study rural livelihoods and the urban demand on a rural space that faces greater constraints with every passing year. We are told frequently by central governments that growth is good (i.e. rising GDP) and that increasing per capita income is a national mission. This assertion has much to do with the boom-and-bust cycles we have witnessed in the last decade: in any number of stock markets, in the banking and finance system, in savings and pensions systems, in commodities, in credit and derivatives, and of course in basic food grains. That these cycles have occurred more frequently has as much to do with growing urbanisation in the South, and the mechanics of globalised capital and market risk. Here are the composite urban Gini coefficients (from ‘State of the World’s Cities 2008/2009: Harmonious Cities’; United Nations Human Settlements Programme (UN-HABITAT), 2008). 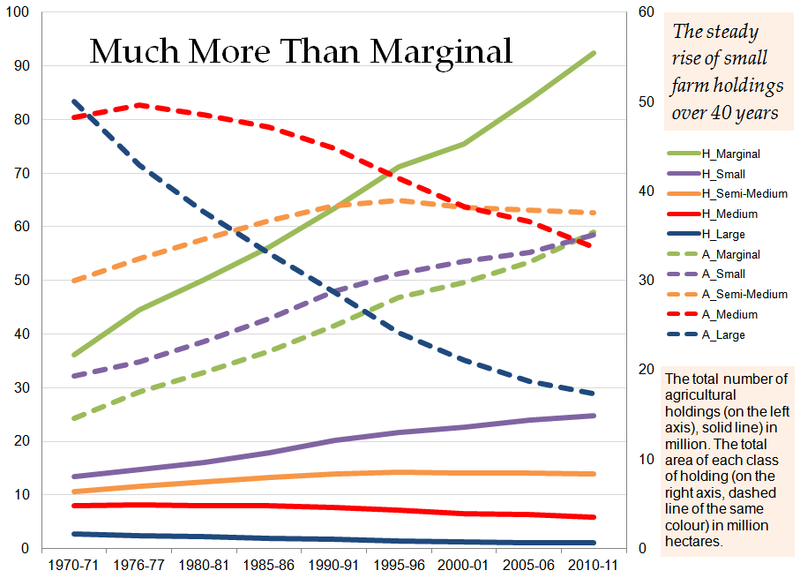 Over a given period (separate for each country), the urban Gini rose most for Nepal (0.26 to 0.43 from 1985 to 1996), China (0.23 to 0.32 from 1988 to 2002), Viet Nam (0.35 to 0.41 from 1993 to 2002), Bangladesh (0.31 to 0.37 from 1991 to 2000), Sri Lanka (0.37 to 0.42 from 1990 to 2002) and Pakistan (0.32 to 0.34 from 2000 to 2004) and it dropped marginally for India (0.35 to 0.34 from 1994 to 2000) and Cambodia (0.47 to 0.41 from 1994 to 2004). Note that the UN-Habitat calculations are only until 2004 for the latest city, and that the impacts of the triple crisis of climate change, financial volatility and food system distortions became widespread only thereafter. 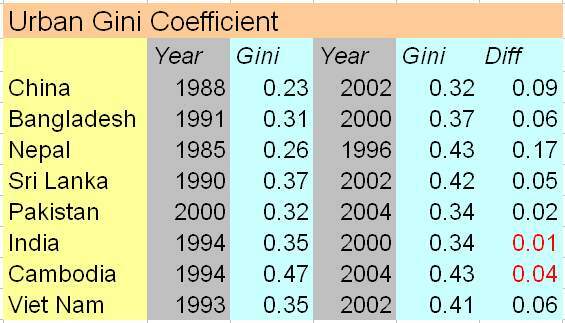 It’s very likely then that in cities in Asia, Africa and South America, the Gini coefficient has risen faster in the last five years than in the decade until 2004. There’s another aspect that the urban Gini indicates, which several country studies have dealt with in the last few years, and that is the rural-urban divide, in terms of income inequality, consumption inequality, inequality in access to basic services and inequality of representation. Yet those at the deprived end of this quotient are also those who grow the food, absorb the agricultural risks, manage the natural resources and steward the crop biodiversity for a country. If we subscribe to the view of a dominant policy theocracy that ‘economic efficiency’ is good, then for such gross inequalities to be allowed to continue is not good, yet they do. For one thing, education and healthcare outcomes are directly impacted by such inequalities, let alone industrially-oriented ratios such as cost of redistribution, investment allocation and ‘growth’. Yet these continue, and are seen in every single country of the South quite conspicuously in the higher bands of food inflation in rural areas as compared with urban areas. If inequality seems inescapable at outcome level however, the rural and urban ‘poor’ are certainly not sitting around waiting to be pushed even further into penury. They are using their stores of traditional knowledge (which have travelled with them just as they have migrated to the world’s peri-urbs) to innovate, adapt and survive. If we look at waste recycling in developing countries, most of it (as tonnage and as material value) relies largely on the informal recovery of waste of every description by scavengers or waste pickers. A raft of studies done on this sector in the Asia-Pacific region provide estimates of at least 2% and as much as 4% of the urban population is occupied in waste recovery (its reprocessing and re-use occupies another set of the population). Is there a similar ‘waste picker’ model of urban agriculture that is being followed, almost invisibly, in Asian cities and towns? Likely yes. It flies under the radar of statistics because it is, per household unit, so small and well integrated with astonishingly tough living conditions. It is seen on tiny patches of marginal lands that are unsettled, usually only because of a city municipality’s hostility to rural migrants. These tiny linear patches run alongside railway tracks, drainage canals, water pipelines, expressways, marshes and swamps, residual watercourses, and between industrial zones. These vestigial connections to the immeasurably healthier lives led in their rural origins by migrants are the only in situ ‘urban farms’ in most Asian cities and towns. Existing municipal planning and zoning in Asia of the South either ignores them or subtracts them from its calculations. Yet such spaces will be vital for our urban settlements. They are currently farmed in squalid conditions, often cheek-by-jowl with small-scale industries and their toxic effluents, and have no option but to use dangerously polluted water sources. Were they to be encouraged, planned for, incentivised and built into ward or neighbourhood food markets, they would lessen the massive burden the city places upon rural food cultivators. In ‘developing’ Asian cities that today are exemplars of more-GDP-is-good economics, there is often an utter disconnection between purchase of food and a recognition of its sources. The size, power and reach of the food processing industry plays a dominant role in enforcing this disconnection, for what it calls its economies of scale would not exist without it. Where lie the answers? 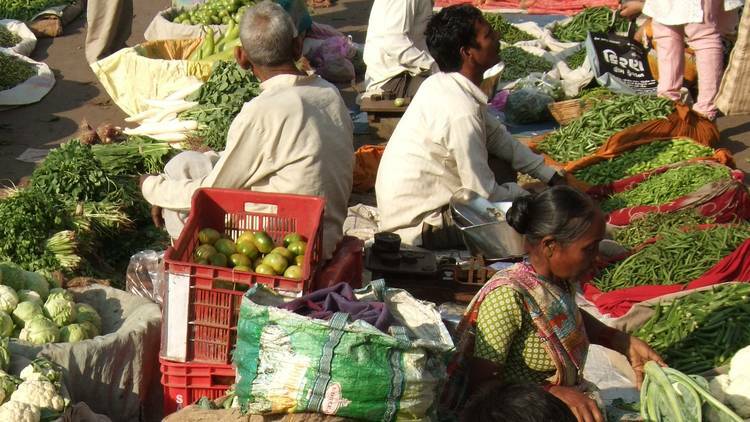 Linking rural food production – not with urban consumers but with urban wards and neighbourhoods – can help bridge the Gini gaps between urban and rural, between urban salaried and urban marginal. Just as in the ‘transition towns’ movement, in which agriculture is being increasingly promoted in urban areas, so too rural non-agricultural livelihoods development is starting to be promoted. Work-in-progress examples include the strategy adopted for the promotion of Town and Village Enterprises (TVEs) in China. These expanded rapidly in China in the post-reform period and as a result of their promotion between 1978 and 2000, the number of workers in China’s rural non-farm and farm labour sector grew, which stemmed the tide toward the hungry cities.